While running a business, you've likely come to understand the importance of having a functioning, informative, and easily found website. Of course, just having a website isn't enough — you need to be using it to reach your sales goals and to bring in more customers. As with most things in business, integration is key. Despite the fact that 95% of retailers agree that digital and physical consumer experiences must be interconnected for one seamless experience across multiple channels, many stores still act like online and in-store activities are separate. Consumers already expect this intuitive level of convergence. Some aspects of this convergence may sit outside your reach for now (i.e., a new POS system that offers real time understanding of in-store and online purchases and stock inventory), but in this article, we're going to focus on in-store and online. When you designed your business space, you probably spent a lot of time considering how to best represent your brand in order to create the right look and feel. Everything from the lighting and furniture to the employee uniforms and decor would be considered, measured, and judged against the aesthetic you want your store to present, in order to attract the right kind of customer. The same should be true of your website, whether you have an ecommerce store or not. Remember, you want to keep your website layout straightforward. If a customer is easily confused by your layout, it doesn't matter how much your products and services meet their needs, they're going to navigate away pretty quickly. However, being simple to navigate doesn't have to mean being plain or boring. Your site is a place to showcase your expertise and to reach out to the customer wherever they are. Use the same typeface and, where appropriate, the same colors. Make sure your store name is clear but not in the way. Do what you can to engender the sense of your brand and your store into the limitations of the online experience. Consider sensory descriptions — if you're a coffee shop, talk about the taste and texture of the coffee, whether the notes are dark or bright. If there's in-store themes or departments, make sure those are worked into the site as well. When you can, integrate actual imagery from your store, whether it's photos of customers and employees or the showroom floor. Another aspect that must align between your brick-and-mortar store and your website are your promotions. Whether it's events in-store or online, sales, bundle deals, or membership offers, creating consistency with your marketing is of the utmost importance. For one thing, consumers are on their smartphones determining where they're about to go next, and for another, approximately 67% of consumers tend to be using their smartphones in-store. If what's online and what's in store don't match, you might just end up losing a customer for good. More than that, is the fact that the benefits of advertising cross-channel include cross-promoting each channel, enhancing each other in turn. Blending online and offline marketing could be expressed in many ways, the least of which is advertising in-store or online sales in the other format. Promoting online contests at your physical locations will drive traffic to both. Taking advantage of advanced targeting techniques like geotargeting customers to send mobile text or in-app offers bring customers both to your app and to your store. Perhaps the most important time of year for this aspect is the holiday shopping seasons. Shoppers will head to your site to see what deals and offers you're going to provide both in store and online. Only offering in-store information in your store could mean missing out on a hefty chunk of business. This aspect is especially key over the holidays! All channels need to accurately display or provide access to basic information such as hours, closings, physical address, and contact information for all locations. Each location should be clearly differentiated, as well. What you don't want to happen is for consumers to see one thing on your site or another official online channel and for something completely different to be the case. Showing up to find the door locked or a sale over is a quick path to consumer frustration. Sometimes what customers want is to browse in store and make their final purchases online. However, in a good number of cases, they'd rather research and shop online, then pick up their purchase in-store. In many ways, this melds the best of both worlds — a smooth purchase journey while maintaining a sense of immediate satisfaction. It also allows them to save on shipping costs and removes concerns about delivery. What does this mean for creating consistency with your marketing? You need to move to taking a synchronized approach. You may already understand the idea of an integrated approach, however, when being discussed this almost always reflects on singular marketing campaigns. With this new approach, all campaigns across all channels should be functioning in sync with one another, and working together to build and strengthen your brand across all segments of your audience and customer base. 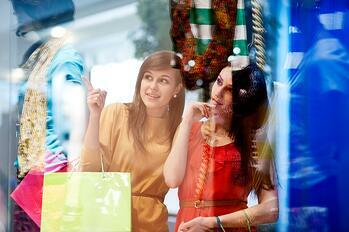 Furthermore, social media offers some truly great opportunities to meld online and in-store interactions. It offers a level of creativity that's hard to beat. Nordstrom, for example, used its most-pinned posts on Pinterest to design in-store displays. Not only does this pique interest from random foot traffic, it excites customers from that platform for having been a part of that process, further building the relationship between consumer and retailer. While the next two options aren't in play quite yet, it bears noting that both Facebook and Twitter are developing in-stream purchase capabilities. Hopefully, now that you have a better understanding of how to create brand consistency in-store and online, you can begin to converge your channels into a solid, multi-faceted representation of your brand. These concepts should strengthen the business you've built and give it the forward-facing momentum it needs to thrive as in-store and online shopping evolve in the consumer journey.